On April 15, 2015, the Massachusetts House of Representatives proposed a $38 billion budget for fiscal year 2016. The spending plan, which was developed by Ways and Means Committee Chairman Brian Dempsey, did not include the change to Group Insurance Commission (GIC) contributions for state employees that was part of Governor Charlie Baker’s budget. NAGE isn’t stopping there. An amendment to the budget is being introduced that would equalize ALL state employees to contribute 20 percent toward their health care contribution. Currently, state employees who were hired after June 30, 2003 are required to contribute 25 percent. This amendment would level the playing field for all state employees, benefitting thousands of people who serve the Commonwealth. The House Budget also includes $17.3 million in additional funding for the Trial Court. NAGE fought to get this provision included in an attempt to avoid layoffs and to restore the number of Trial Court employees. Since 2003 the Trial Court has lost roughly 2,200 employees. NAGE Local President’s also weighed in on the House budget. This shows you how much impact we have when we work together. NAGE had a big presence at lobby day and now we can see legislators paid attention. Now we have to keep them paying attention until all state workers are paying 20% for their insurance. The state can’t continue to make its own employees bear the brunt of every budget crisis. I’m grateful that the House leadership stood up for the people who keep the Commonwealth running. We’re not out of the woods yet, but it’s a very encouraging sign. This is a huge win, especially for workers in lower-paying job titles. We got those employees some well-deserved economic justice in the last contract. They don’t deserve to lose it to health insurance costs. Thank you to everyone who reached out to their lawmakers. It feels good to find out that the House leadership listened to us and to our members. We’re not done yet, but now we know they got the message. Let’s see if we can get them the message that all state workers ought to be paying the same share for their health insurance. Shifting $170 million in health care costs onto state employees isn’t a savings. It’s a burden on the people who work for all of us. It’s a good day when the leaders of the House say “no” to a plan that would have made that burden heavier. It was impressive to see how many people from NAGE went to the State House on lobby day. Obviously the legislators were impressed, too. That’s why we all need to be talking to our elected officials when NAGE puts out the call. We make things happen when we work as a team. The employees at the Trial Court are overworked, the increase in funding will help meet the public safety goals of probation while providing increased resources. The Trial Court has been understaffed for some time and getting this funding is a big step in the right direction. This is the reason we ask our members to get involved. 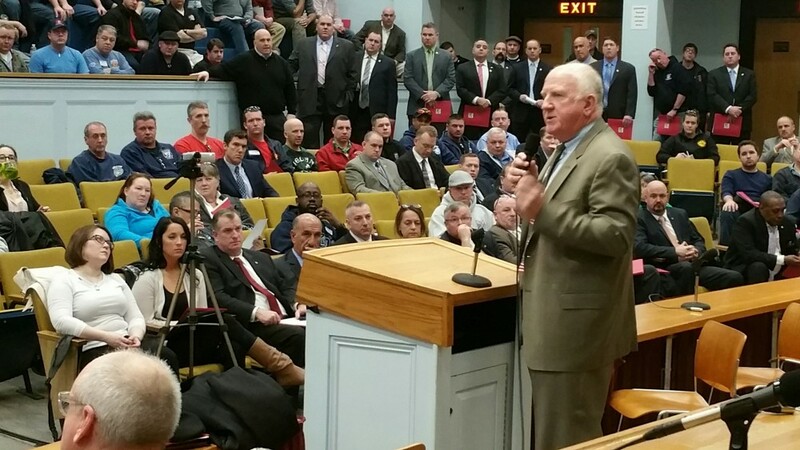 When we get involved, the people at the State House pay attention. We will have more information on the budget as it becomes available, please check NAGE.org for updates.